On April 13, 2016, students, alumni, donors and faculty of the Mark S. Bonham Centre for Sexual Diversity Studies gathered at Hart House for the fourth annual Bonham Centre Awards to celebrate the contributions of LGBT business and policy leaders. 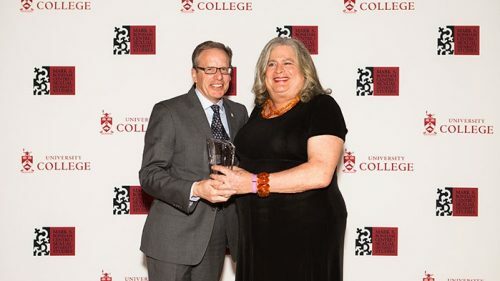 Among those feted was COL Jennifer Pritzker, Founder of the TAWANI Foundation and President of TAWANI Enterprises, Inc.
Much to the surprise and delight of the attendees, Colonel Pritzker gave an award also, in the amount of $60,000 to be used to fund a new trans studies course. The attendees responded with a standing ovation.